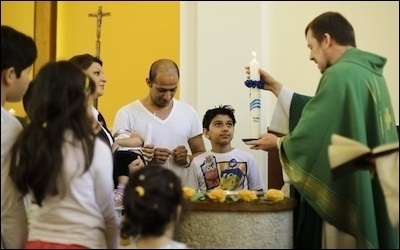 Gottfried Martens, the pastor of a Berlin church, says some Muslim migrants seek conversion to Christianity in hopes of boosting their asylum chances. If Trump has his way, this practice will become routine. Donald Trump, the leading Republican presidential candidate, called on Dec. 7 for "a total and complete shutdown of Muslims entering the United States until our country's representatives can figure out what is going on." Replace one word in this formulation and it goes from outrageous to brilliant. Reacting to massacres by Muslims in Paris and San Bernardino, Trump pointed to a Muslim hatred "beyond comprehension" for the West. Therefore, he concluded, "Until we are able to determine and understand this problem and the dangerous threat it poses, our country cannot be the victims of horrendous attacks by people that believe only in Jihad." The negative responses, domestic and international, Muslim and non-Muslim, came in fast and furious – and rightly so, as Trump's crude blast is unconstitutional, unacceptable, unworkable, and unstrategic. Unconstitutional: Every Western basic law is secular, disallowing a religious test for immigration, rendering Trump's statement less an exercise in practical policy making than a gadfly provocation. A ban on Muslims entering the U.S. is unconstitutional, unacceptable, unworkable, and unstrategic. Unacceptable: Beyond legalities, secularism represents a Western core value, up there with freedom of speech, a value hardly anyone accepts gutting for reasons of momentary expediency. Unworkable: Islam is not a permanent identity like skin color. Nothing prevents Muslims from renouncing Islam or converting to another religion. Unless Trump extends his "total and complete shutdown" to former Muslims – which is even more unconstitutional – he just encourages the already-existing phenomenon of Muslim conversions of convenience (as symbolized by a church in Berlin). Unstrategic: Trump's presidential campaign once again is counterproductive; he simultaneously makes conservatives look like idiots and brings adoring attention to those who oppose his views, in this case radical Muslim groups like the Council on American-Islamic Relations (widely known as CAIR), which has enjoyed an unprecedented cornucopia of media coverage to spread its deceitful message. That said, Trump has raised a critical and urgent issue that all Westerners must face, as symbolized by the recent tsunami of illegal immigration to Europe and the huge strains it has created. Simply put, Muslims present a disproportionately large source of problems, as becomes clear when they are compared with Hindu immigrants, who are roughly the same in number but generally fit quietly into the West. Muslim immigrants in Europe have presented a larger source of problems than non-Muslims. Violence is the headline topic relating to Muslims, whether large-scale plots (Paris) or sudden jihad syndrome lone wolves (San Bernardino), but violence is hardly the whole problem. Muslim hostility toward non-Muslims takes many other forms, such as teaching Islamic supremacism in mosques, spewing antisemitism in the streets, and threatening anyone who dares publicly to criticize Islam. Issues concerning women include female genital mutilation, honor killings, polygyny, and forced marriages. Islamic mores lead to strong antipathies against seeing-eye dogs, mixed swimming pool usage, and homosexuals. Polls show widespread – and legitimate – concern about these issues as well as growing impatience with governmental dismissal of those concerns. When Germany's Angela Merkel welcomes an unlimited number of illegal immigrants or Barack Obama ridicules concerns about Syrian immigrants, populist voices like that of Donald Trump inevitably find followers. Indeed, he is just the latest anti-immigrant figure to find a message that increasingly resonates. Geert Wilders' PVV in the Netherlands wins 39 out of 150 seats in parliament in a recent survey, up from his current 15 and almost twice that of any other party. In the French regional elections a week ago, Marine le Pen's National Front led in 6 out of 13 districts. This upward trend will continue until one of these ostracized insurgent parties gains over 50 percent of the vote and enters office. In this sense, Trump stands at the cutting edge. Islamists shouldn't ever be allowed into the U.S., even for brief visits. How to deal with Muslim immigration in a responsible and uncontroversial manner? I offer two suggestions. First, replace the "Muslims entering the United States" in Trump's formulation with "Islamists entering the United States." Islamists are those Muslims who seek to apply Islamic law, oppress women and non-Muslims, and establish a worldwide caliphate. They make up about 10-15 percent of the Muslim population; they, not Muslims in general, are the barbarians who "believe only in Jihad." Second, engage in serious research into all would-be visitors and immigrants, not the pro-forma review that prevails these days. Doing so requires money and time, as well as creative inquiries to smoke out ideological proclivities, but each person entering the country must be checked to make sure no Islamists are allowed in, ever, at all, even for brief visits, thereby increasing our common security. (2) Readers have asked how I would distinguish Islamist from non-Islamist Muslims; I dealt with this question at "[Finding Moderate Muslims:] Do you believe in modernity?" I have also collected the questions others would pose at "Finding Moderate Muslims - More Questions." Dec. 12, 2015 update: I linked in the text above to a Dec. 8 Associated Press article, "Legal Experts Agree: Trump's Proposal Unconstitutional," that quoted various constitutional scholars agreeing that Trump's "shutdown" idea is unconstitutional. Now, the Associated Press runs an article, "No consensus about legality of Trump's idea of Muslim ban," implicitly taking back the claim to a consensus.